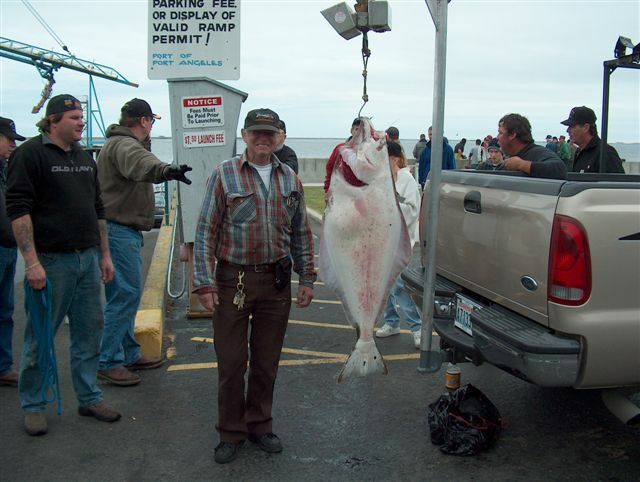 2003 PORT ANGLES HALIBUT DERBY ITS' OVER FOR NOW BUT ITS' ON FOR NEXT YEAR! The Port Angles Halibut Derby had 20,000 in cash prizes for a two day assigned boundry fish out. The PA fisherman showed thier knowledge as well as an assortment of others from all over. There were your "The Fish That Didn't Make it to Weigh-in in Time" and the "The guy that Bled his fish in the fishing grounds and Lost Ten Pounds" as well as many more great fishing tales. This year also gave birth to the first women derby winner. Congrats!!! To all of you that missed it be sure your in the picture next year. CLICK BELOW FOR THE LATEST INFO.